WILL ANOTHER TORRENCE (STEVE) GO HOME A WINNER IN LAS VEGAS? March 28, 2012 -- As he grew older, Steve Torrence watched his dad Billy compete in drag racing’s Super Comp category and knew what he wanted to do. The young Torrence did just that when he was 15 years old and joined his dad on the quarter-mile race tracks. While Billy Torrence over the years preferred to stay in Super Comp racing, his son had other ideas. Steve stepped into a Top Alcohol Dragster in 2005 and was tough to beat. He won nine times in 11 final rounds in only 13 races on the way to the series championship. A year later, he made his debut in a Top Fuel dragster, and two years ago he placed eighth in his first full season of Full Throttle Series action. Now, almost 14 years later – he will be 29 on April 17 – Steve hopes to emulate his dad in the 13th annual Summit Racing Equipment NHRA Nationals, March 30-April 1, at The Strip at Las Vegas Motor Speedway. After sitting out much of the 2011 season while assembling what has become a very competitive team and crew, Torrence has already lowered his best 1000-foot elapsed time to 3.788 seconds and boosted his fastest speed to 322.04 mph after three events. He is ninth in Full Throttle Series points with 14 of 17 regular-season races to go. “This is the first time I’ve had a good car on every lap,” Steve said. “I spent the time between races working to improve my reaction times. I just need more seat time to focus and concentrate in the car. I want to do well because my guys brought me this far and we want to keep improving. Two days of fun in the sun was on the team’s agenda before they arrived in Las Vegas. And they weren’t even near any water. 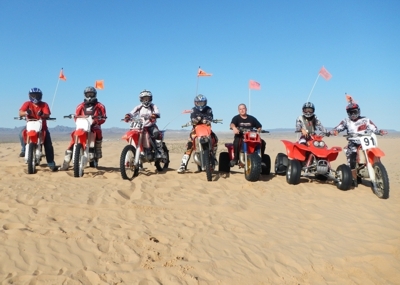 “My guys have been working hard and they needed some time to get away from the car,” said Torrence, “so we decided to ride our dirt bikes in the desert sand dunes of Glamis, Calif., near the Arizona border on Sunday and Monday. It was a blast! “We had a two good days of fun. It wasn’t your typical rest and relaxation, but it was a perfect way for our guys to get some down time, and (Pro Modified racer) Leah Pruett also joined us. We are all good friends and we just enjoyed it.